I was recently asked by a local hospital to photograph a surgery which was using the new DaVinci machine. 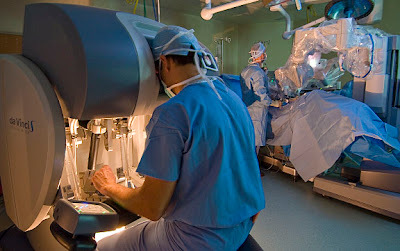 The DaVince machine is seen here in the foreground, the surgeon using the machine is looking into a 3 dimensional view of the patient prostrate. The surgeon working on the DaVinci machine move the controls real time and the surgical tools above the patient move in tern. Cool beans. As far as lighting is concerned, I placed on the floor between the surgeons legs a Nikon SB-800 with the diffusion dome on. I placed another SB-800 on the floor pointed towards the patient. This strobe also had the diffusion dome on the strobe head. Both strobes where fired using the Nikon SU-800 command unit. I was able to control both strobes right from behind the camera.